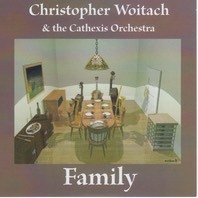 "Family", Christopher Woitach's first recording as a leader, is the product of years of honing his playing and compositional style. While studying composition privately with counterpoint master David Borden at Cornell University, Woitach developed several compositional techniques that are employed throughout the recording. The first of these is the juxtaposition of Baroque forms, mostly fugues and canons, with improvisatory passages instead of the "free" material that is found between the various statements of the main subject. The other technique used extensively on "Family" is Woitach's method of matching up notes to the alphabet and writing out "words" that have meaning to the subject of the piece, thus creating the melodic and harmonic material that serves as the basis for the piece. While techniques like these have been used for many years, Woitach's particular take on them creates a unique sound when coupled with the high quality jazz musicians who play on "Family".